MSC Industrial Direct Co.: Near-Term Pain, Long-Term Gain? The industrial supply company unveiled a mostly disappointing set of results, but management outlined some long-term strategic opportunities. Anyone with lingering doubts that the manufacturing sector is in a slowdown need only take a look at MSC Industrial Direct's (NYSE:MSM) fiscal fourth-quarter results, which were released on Tuesday. Just as rival W.W. Grainger (NYSE:GWW) indicated in mid-October, MSC Industrial is seeing a challenging environment in which revenue growth and margin are coming under pressure. In reality, industrial supply companies have limited visibility, so future guidance is subject to change, but they do give a very accurate reading on current conditions. Let's take a look at the earnings report. Net sales were essentially flat year over year at $727.4 million, which was below the low end of the guidance range of $735 million to $747 million. CEO Erik Gershwind referred to the "difficult and deteriorating environment" facing the company in its fourth quarter. Indeed, just a couple of weeks ago, Grainger cut its full-year sales expectations to a range of negative 0.5% to 0.5%, from a previous forecast range given in July of 0% to 2% growth. On a brighter note, MSC Industrial's EPS of $0.96 was at the high end of the $0.93 to $0.97 guidance range. How was this achieved? The answer is three-pronged. First, gross margin came in at 45% when management had expected 44.5% to 44.9%. By my calculations, this was worth about $0.02 to EPS. Second, its tax rate of 36.9% was lower than the 37.4% predicted in its guidance, a difference that was worth around $0.007. And third, operating expenses came in $4 million lower than expectations, a difference worth approximately $0.004. Adding those items together gives around $0.03. If that were subtracted from $0.96, then earnings per share would have come in at $0.93 -- the bottom end of the guidance range. In short, it was another quarter during which management found ways to make cost cuts that helped EPS, but that's not something they can do forever. I recently wrote a preview of MSC Industrial's results, in which I suggested five things to look out for. I've already discussed its disappointing sales, and how management did relatively well on gross and operating margin for the quarter. Moreover, as you can see below, MSC Industrial is starting to see weaker growth from its non-manufacturing customers, too. The latter tend to contribute around 30% of its sales. In addition, margin could come under pressure in future quarters as small and medium-size businesses appear to be bearing the brunt of the slowdown -- smaller accounts tend to be higher-margin for the company. In fact, revenues from large accounts grew by $13.5 million in the quarter while revenues for the rest declined by $12.7 million. Listening to the earnings call, it was clear that management is focused on reducing costs to adjust to a deteriorating sales environment -- guidance for the first quarter has sales declining 2% to 4%. At the same time, Gershwind was keen to highlight the opportunities for a larger, more financially secure company like MSC Industrial to consolidate a fragmented industry in a downturn. The message was that conditions are tough, and near-term trends are against the company, but management is focusing on strategic opportunities in the long term, and holding margin up in the near term. 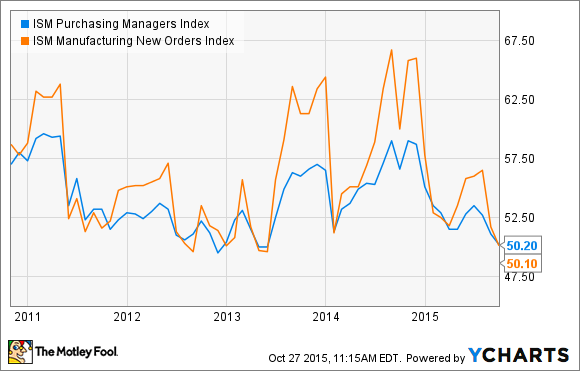 Ultimately, conditions in the industrial sector -- and to a lesser extent the construction sector -- are going to guide the top line for companies like MSC Industrial and Grainger, and investors should keep a close eye on the ISM Manufacturing Index. Any kind of bounce in energy and commodity prices could spur some inventory rebuild at heavy-machinery companies that service the sector -- something to keep an eye out for in the near to mid-term. On a longer-term basis, investors should look for the company to continue to expand capacity, or possibly make acquisitions, in order to consolidate the industrial supply industry at a time when the smaller players are suffering.